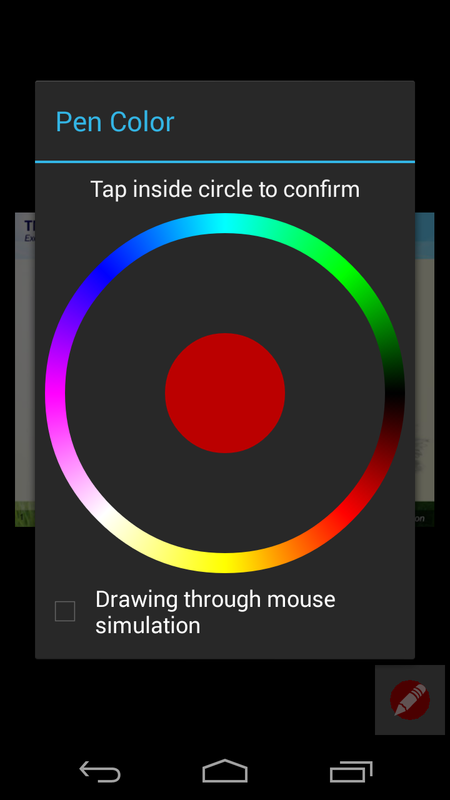 If pen color does not work on PC/NB, please try to change drawing mode settings. 如果 筆的顏色 在 PC/NB 端沒有作用, 請嘗試更改 繪製模式 設定. 1. Your computer must install the PowerPoint application of Microsoft Office. 2. You must download software of PC client to your PC, install and run it. Include install and install-free versions. 4. 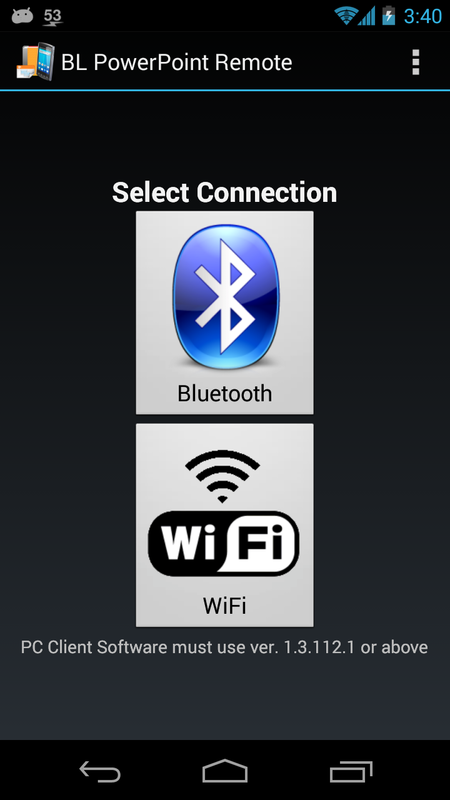 Click on "Settings" int the menu, than you can see the Bluetooth and Network settings dialog. 5. 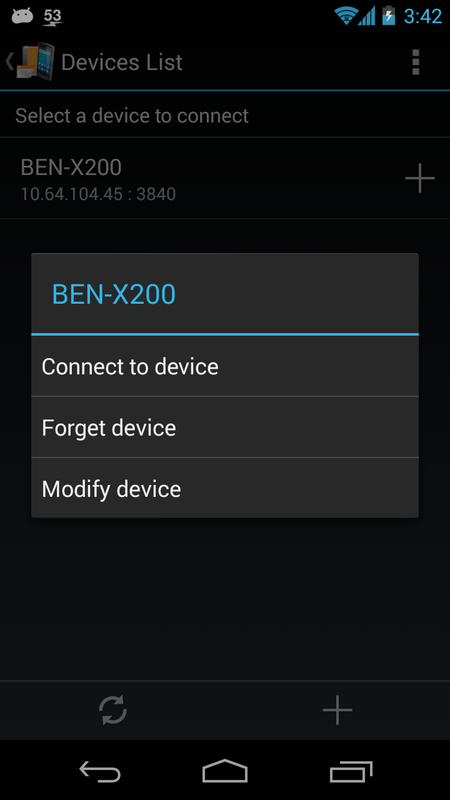 In the Settings dialog, you can set to enable the Bluetooth and Network connection, and select a network adapter and port number. 在設定對話框中, 你可設定啟用 藍牙 與 網路 的連結, 和 選擇 網路介面卡和埠號. 6. In the Settings dialog, you can set to enable the Downsize Slide and select the maximum size of slide image. 7. 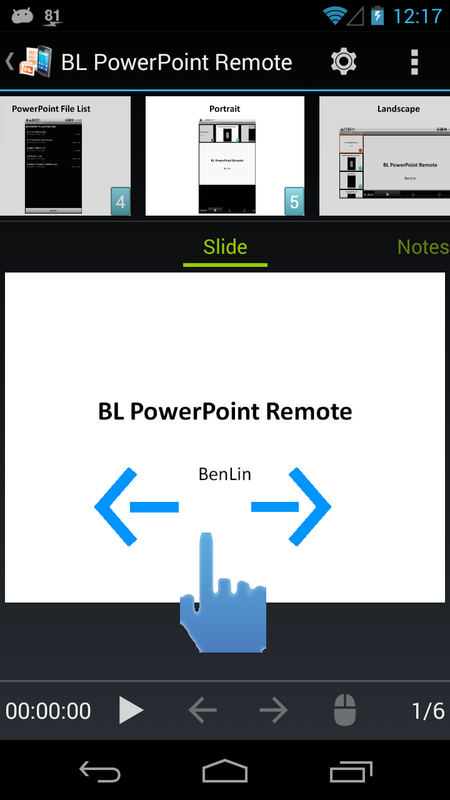 Click on "PowerPoint" in the menu, than you can see the PowerPoint dialog. 8. 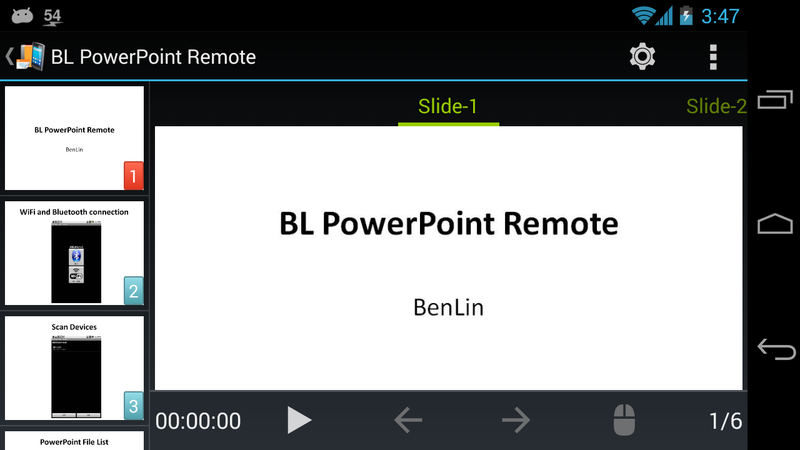 In the PowerPoint dialog box, through new and delete buttons, you can set presentation PowerPoint files list. 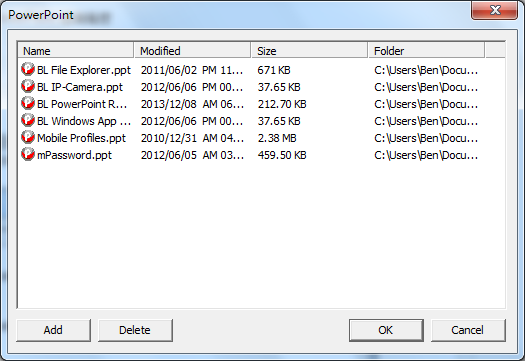 Or from windows file explorer drags & drops files to PowerPoint dialog box. 在 PowerPoint 對話框中, 經由新增與刪除, 你可設定要簡報的 PowerPoint 檔案列表. 9. Finally, click on "Start Service" in the menu. Please add a function to use the volume up down buttons to switch slides backwards and forwards. So I can go to next slide without looking at the phone. Version 2.1.131229 has added volume up/down buttons to switch slides backwards and forwards. Thanks for adding this so quickly! Would be great if the phone would not beep when pressing the volume keys. It seems all images are much smaller now, compared to the previous version (tested on LG G2). Version 2.1.140101 has disabled volume buttons sound. There is some problem with synchronization of slides on pc and on phone. On first go it runs fine but if I tap on a slide to go to that slide it goes to that slide but then if I use volume buttons or forward back button on pc everything works but on phone it stuck on that slide and doesn't change. It may be problem with my configurations but Bluetooth connection also doesn't work it shows unable to connect device. I tried another app and Bluetooth connection works with that. 1. I can't reproduce your problem, could you give me more detail information or your ppt file to let me try the problem. 2. 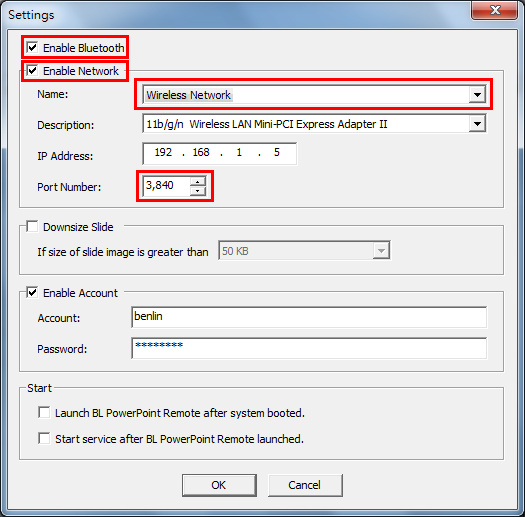 About Bluetooth, please confirm to turn on Bluetooth device on your PC/NB and check the "Enable Bluetooth" button on settings dialog of PC client software. Thanks you for your suggestions, I will assess the feasibility of these recommendations. "Failed to Open Powerpoint" on my Windows 8. Run in compatibility mode and as Admin. it open powerpoint but not the file. I tried it with win7 with same MSOffice Version and pptx file and work fine. Could you tell me what version do you use? 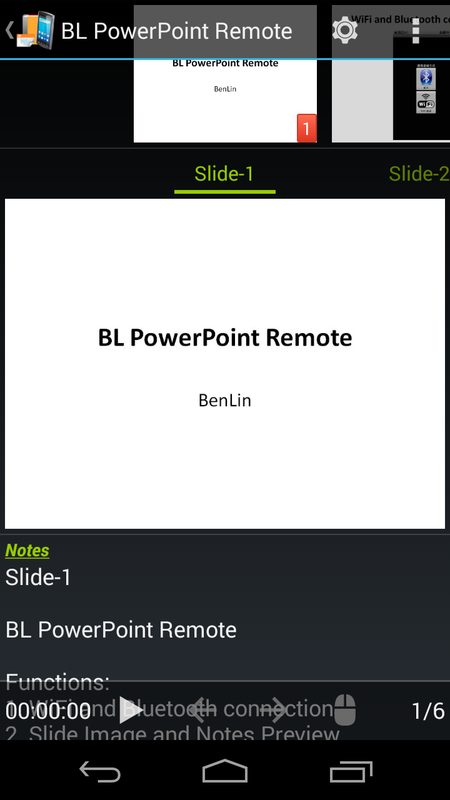 BL PowerPoint Remote on Android and PC ? The app is allowing me to connect however, once the slides load to my phone I am unable to control the slides. The PC does not respond to me advancing to the next slide. What did I do wrong? Only in the presentation mode you can change slide. Do you start presentation mode? 1. Check your PC client software and App are the latest version. 2. 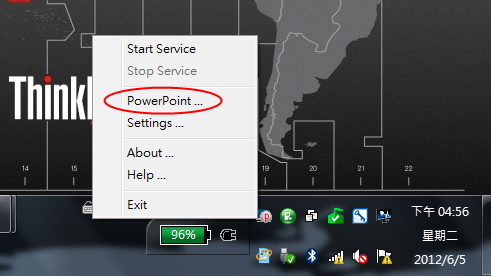 Check the Microsoft PowerPoint application can open the file on your PC/NB. sorry if it seems like i'm asking a lot but i find your app great and i think that with just some of these suggestions it could be even better. 1. 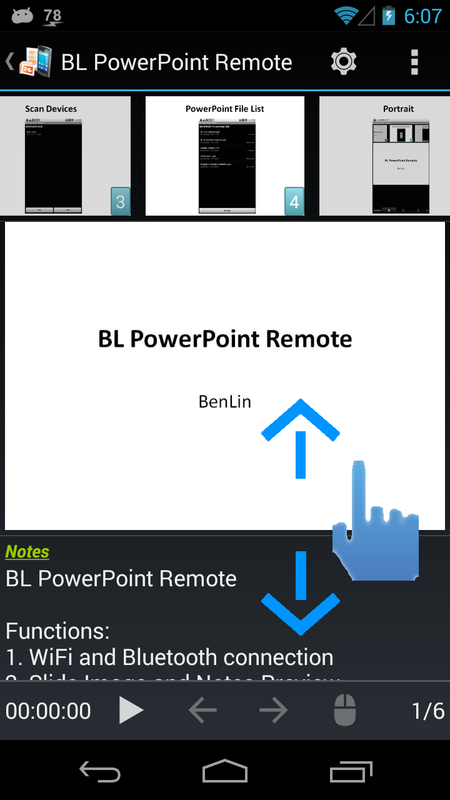 Please try to uninstall BL PowerPoint Remote and re-install it again. 2. 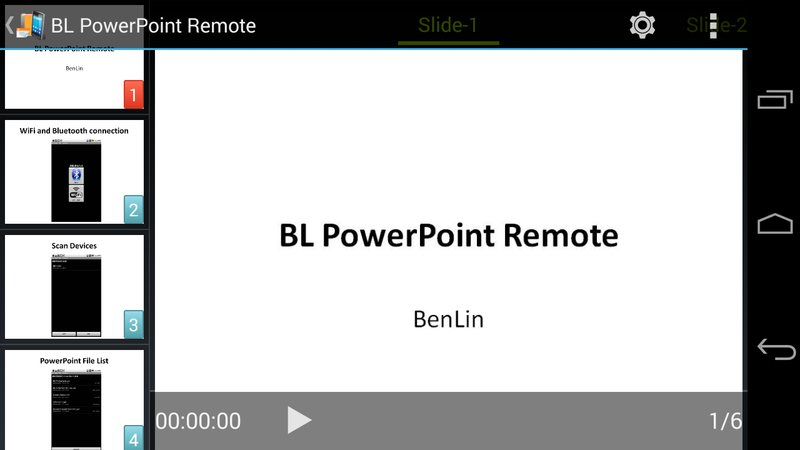 The first time you launch BL PowerPoint Remote, please confirm your internet connection is working. 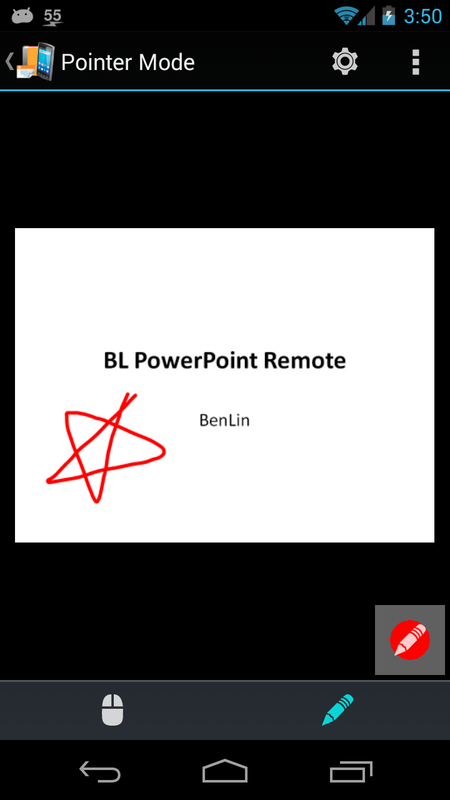 PowerPoint screen pen I want to change the color from black to red. 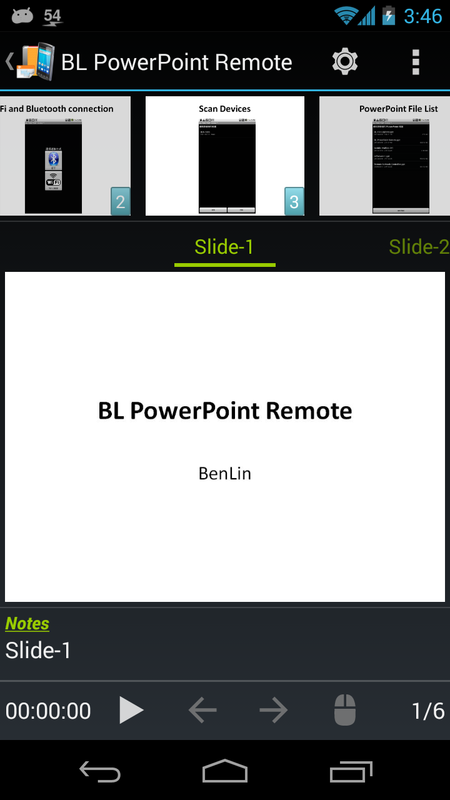 I am big fan of your product, love it so much and so far still the best ppt remote. However i have sugestion to be consider, sometimes we presenter want to write something and back to powerpoint and sometimes want to ho back again to what we write earlier. 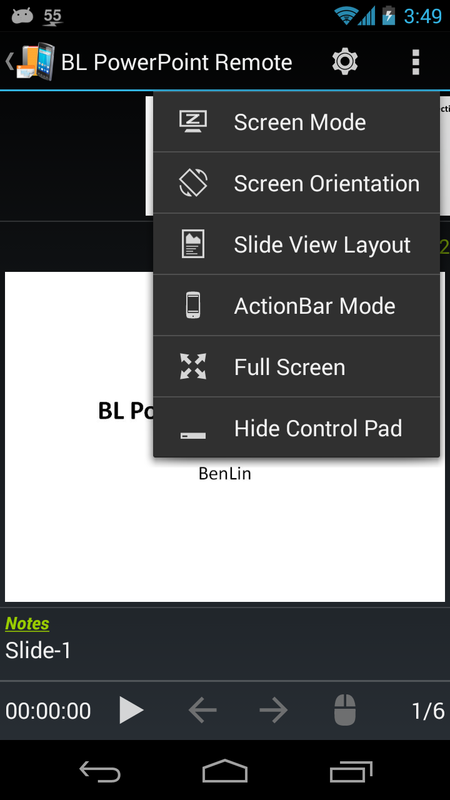 In your apps you already provide capability to write on ppt but not quite easy for use. This easier feature lately provided by MS powerpoint 2013, please look at it first then you will understand. I try to connect via bluetooth. 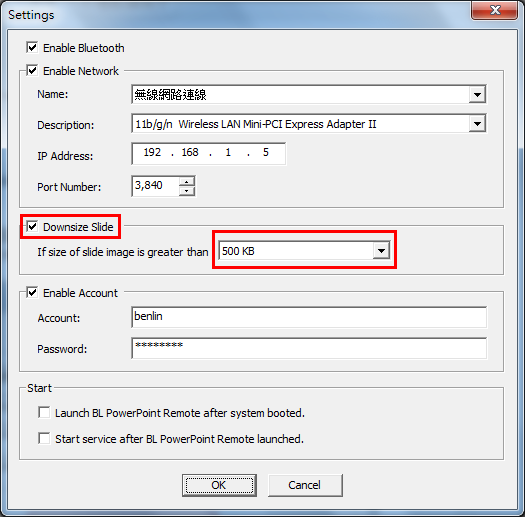 After selecting the paired PC, flpp remote fail to connect although pc was already paired to my SHV-E250K and checked the "Enable Bluetooth" item on the settings of PC client software. To the contrary office remote was probed to work well via bluetooth. Please let me know how to connect via bluetooth. 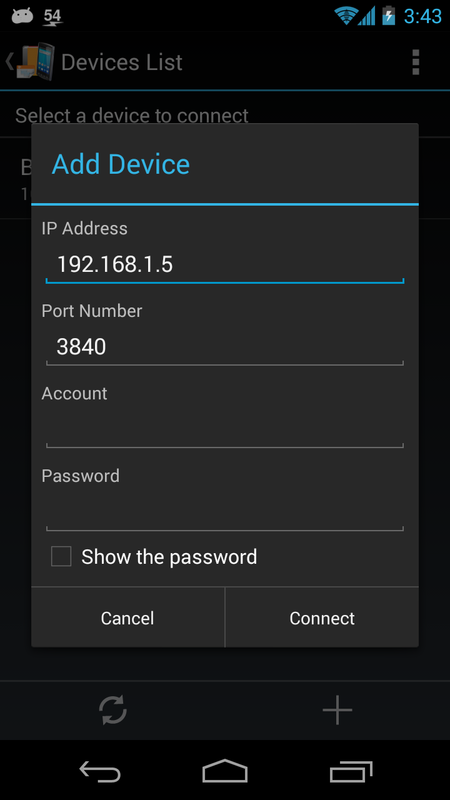 Please disconnect to pair between pc and mobile first, then use blpp to connect pc via bluetooth. You can check "Enable Account" item then set your account and password in the Settings dialog on PC client software. If you do not want the account and password, just unckeck "Enable Account" item.